Today we planned for a weekend of activities at the same location we've been at all week. While we're ready and eager to see some new terrain, we had no shortage of interesting science targets to fill our plan. On the first sol of the weekend plan (Sol 1961), we have a nice long science block that we've filled with a suite of ChemCam observations: LIBS measurements on bedrock targets "Glenfinnan" and "Skara Brae," a long-distance RMI image of the lower slopes of Mount Sharp, and a passive measurement of "Bloodstone Hill." 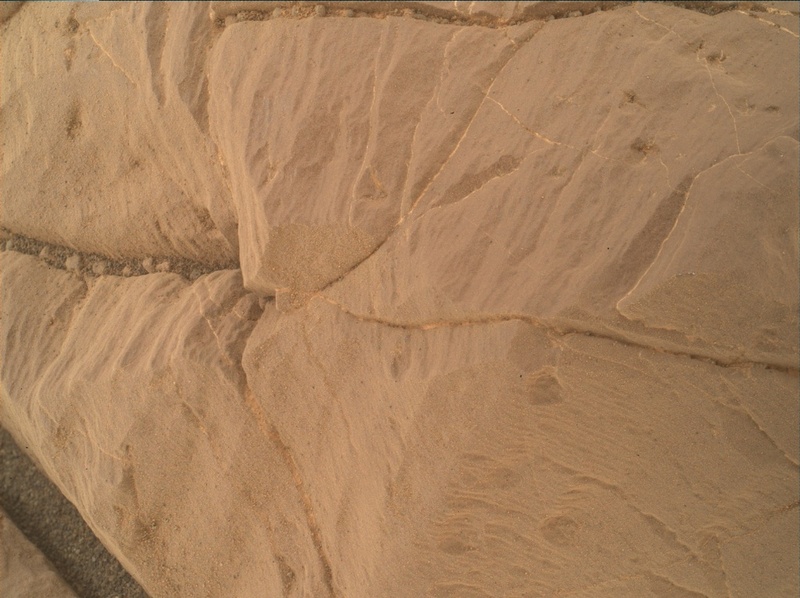 We'll take a Mastcam image to document the LIBS targets and an additional Mastcam image for change detection. When we're at a single location for an extended period of time, we like to take repeat Mastcam images of the same target area across multiple sols. This allows us to compare the images and look for any changes or movement in the field of view. Finally, we'll take a Navcam movie to look for dust devils. In the evening, we'll take MAHLI nighttime images of Glenfinnan and Skara Brae to take a closer look at some of the small-scale features within the rocks, with the additional benefit of some dust having been cleared by our LIBS observations during the day. The Skara Brae rock target is shown in the MAHLI image above. On the second sol, Sol 1962, we'll drive to our next VRR location, take some post-drive images, and set ourselves up for an exciting week of contact and remote science!